As a multicultural familia, multilingualism and travel go very much hand in hand since the target language that I’m teaching our child is Spanish, hence being the minority. Therefore, my mother who lives in Puerto Rico, and I made an agreement to visit each other every year. Meaning one year she’d travel to the U.S.A., the other year we’d travel to Puerto Rico. Traveling was our way of preserving the family ties, as well as keeping the culture and language alive especially for our child. During Abuela’s visits she’d speak to our child in Spanish, and when we traveled to Puerto Rico he would be directly exposed to the target language because all of the familia would speak in Spanish. Though, I do admit there have been times where my family has spoken to our son in English, instead of Spanish. I am to blame since I started our son’s language immersion a little later on. You can read about my initial struggle here, and about his milestones, and my regrets here. Nevertheless, I’m thankful for la familia’s (Abuela, titi, tío, & primos) frequent travels to the U.S.A. La familia extendida and our baby’s travels have given him some exposure to his target language. He’s 4 yrs. old, and he’s traveled more times in his short little lifetime than me at his age! By plane he has traveled to: New York, November 2008; Puerto Rico, January, July & December 2009; Puerto Rico, November 2010; New York, March 2011 and Louisiana, December 2011. By car on family road trips (too many times to list the dates): Georgia, North Carolina, Alabama, Florida, and within our state of South Carolina. 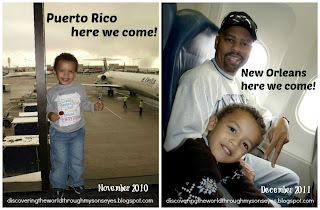 This summer we’re truly looking forward to an overdue visit to Puerto Rico (it’s been 2 1/2 years since our last visit). This trip will be different from any other, because this time our son will be fully engaged in a two week full Spanish immersion trip. He will be able to express himself in a language that until the other day I thought he would never learn. The language he has come to love, enjoy and speak: Spanish! Although our son is too young to remember his many travels or the places that he’s visited, these memories have already been ingrained in his little mind. The language exposure no matter how much or how little will be forever present. In the words of Lao Tzu, “A journey of a thousand miles must begin with a single step.” I am so truly happy that I took the first step towards my son’s language learning, and he is on his way to a lifetime journey of multilingualism opportunities. 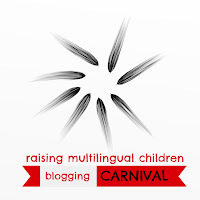 This post has been written for inclusion in the Multilingual Carnival’s theme “Multilingualism and Travel” hosted by All Done Monkey. What a little traveler you are raising! He is lucky to have parents that are so attentive to his progress and to maintaining his family ties. And most importantly, hope you all have a lot of FUN this trip! And really love the quotes you open and close this post with. Blessings and lots of love! This is going to be such an exciting trip, especially after all the work you and your son have put into his Spanish language learning. I can't wait to read about it. So impressed by your commitment. My husband has extended family in the Dominican Republic, and we have been contemplating/discussing moving there for a few years now while our sons are young enough to benefit from complete language immersion. We would also love to spend summers there instead – just trying to figure out how to make it work. Thanks for sharing. Impressive amount of traveling you've taken on with your little one. Bon Courage! I know what you mean about the amount of travelling they do. My son is two years old and has travelled more by plane than I managed by the age of 22! Have a fantastic trip! Your son is so fortunate to be able to have these experiences at such a young age. Oh how I wish I had extended family in a Spanish-speaking country! BTW, I absolutely love the "world is a book" quote. So true. Thank you my friend! You have been a witness in our language immersion with all of our "ups" and "downs"; and I can't wait to share with you all our next language adventure! Hahahaha yes, Bon Courage! 🙂 I look back, and don't know how I did it! LOL Thank you for stopping by! Awe thank you! We're so looking forward to this trip! I love the opening quote as well! You don't necessarily have to travel abroad, but you can do so in your own country. 🙂 Thanks for stopping by! Hahahaha I can totally relate! I traveled for the 1st time ever when I was 7 yrs. old! Go figure! 😉 Thank you for stopping by! Good for you for giving him your Spanish and the gift of travel! These are so important and will last him a lifetime and even effect your grandchildren and great grandchildren as you encourage him to pass on the heritage language and love of travel. Doing Spanish immersion where it is the dominant language will make a HUGE difference and also help him understand the value of being bilingual. We are monolingual American parents raising a trilngual/triliterate kid in Spanish/Mandarin/English, so understand the challenges, but she is 12 now and we can see that all the hard work and commitment was sooo worth it! She has seen more of the world than most ever see ( 46 countries on 5 continents on $23/day pp) and can now talk to the majority of people on earth in their native tongue ( soon to add French so even more). If we want to create a peaceful, better world, we need such 21st century kids that are world citizens and parents who open the world to them through multicultural living, travel and language learning. Keep going and enjoy the process!